These guides aim to give bitesize advice on the benefits of being pragmatic when playing 40k. They do not intend to delve into mathematical analysis of whether or not the units used in the example are optimal or cost effective, nor do they intend to cover load outs or configurations. Those will be left for other discussions. It is also worth noting that the examples in these guides are simplified for clarity, of course in practice there will be more units involved. 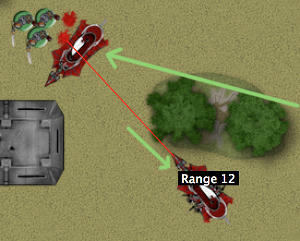 Blocking is a simple concept: enemy units can't come within 1" of one of your units unless they are charging. The Raider is an ideal blocker. It can cover 30" in one turn and ignores intervening terrain/models. This mobility makes it easy to get the Raider wherever it needs to be to obstruct your opponent's movement. It has a large foot print, which makes it a bigger obstruction. WARNING: with all blocking tactics it is imperative that you watch out for unit types that can circumvent intervening models (Jump Pack Infantry, Jet Pack Infantry, Jetbikes, Flying Monstrous Creatures, Skimmers, and Flyers). A Raider full of Kabalite Warriors has just rapid fired into a marine tactical squad killing three of the marines. Another Raider, which is empty, has moved flat out in the shooting phase in order to block the tactical marines. It has been positioned so that the marines have to spend a turn circumventing it, effectively preventing any forward movement. This leaves the tactical squad with two options. One is to waste a turn moving around the Raider in order to shoot at the other Raider (full of Kabalite Warriors) without the benefit of rapid fire or the squad's melta gun. The other option is for the tactical marines to shoot and assault the empty Raider. The marines have to shoot the empty Raider if they want to assault it as per the core rules, to make use of their krak grenades, meaning they won’t be able to shoot anything else that turn. If the marines end up assaulting the raider they will have moved a total of 1” forward that turn as units can't consolidate after assaulting vehicles. Furthermore if the empty Raider gets wrecked it will leave dangerous/difficult terrain obstructing the marines in their next turn, potentially giving the Kabalites in the other Raider another turn outside the marines rapid fire and melta gun range. A unit of Grey Knight Terminators has just deepstruck, landing near a Raider full of Kabalite Warriors. The Raider moved away and its passengers rapid fired the terminators, killing two, the empty Raider then moves in to block (using it's flat out move as it was previously on the other side of the board). On the Grey Knights turn the terminators charge the empty Raider destroying it, gaining an inch, and potentially leaving a wreckage. The Raider moves back an inch and its passengers rapid fire the Terminators again, getting a second shooting phase. On the Grey Knight's turn the Raider full of Warriors is still 12" away from the Terminators, the Terminators take a difficult terrain test and move 4" (from the wreckage), they use their run move to try and get out of the crater and just manage clear it. The Raider full of warriors moves away and gets a third shooting phase and so on. In this fashion you can prevent enemy assault units from reaching your line, even delaying them a single turn can give you enough time to pound them into the dust, with practice you can turn a few inches of ground into a mile. This is particularly useful when a deepstriking force tries to pins you in a corner and you have a very limited space to fall back to. Thankfully flat out moves are done in the shooting phase, so you can wait to see how things go before deciding to block with your Raider. The Raider moves flat out to block the marines, even if the marine army has the fire power to down the Raider it should still be able to prevent the marines from getting within 3" of the objective (as movement happens before shooting). This will deny the marines victory if the game were it to end on turn 5. Again this takes advantage of the fact that units do not get a consolidate move after assaulting vehicles. 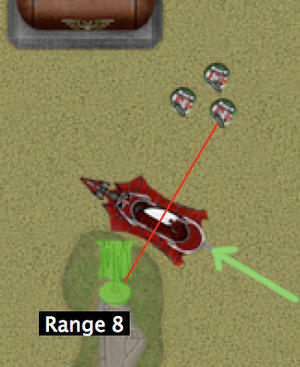 Don't forget the marines could run in the shooting phase so might still make the objective if they are lucky! A Land Raider crusader full of assault terminators is moving towards the Dark Eldar line. Two Raiders flat out and block it, forming a triangle. This prevents the Land Raider from moving forward this turn; if it wants to move it will have to reverse. The Land Raider could ram the raiders, inflicting a single S8 AP- hit on the nearest one, and if it explodes a S8 AP- hit on the second raider (rammer halts unless its target explodes). However, a ramming prevent the Land Raider’s passengers from disembarking, forces it to fire snapshots, and if either of the rammed raiders are not removed the, rammer halts (preventing forward movement of the Land Raider). The only way for them to disembark is out of the side doors, or if Land Raider reverses. The other option is for the Land Raider to stay stationary and try and shoot the Raiders (though this still stops it from moving, and its contents from disembarking). This accomplishes a few things; it stops 300-400 points of your opponent's army getting into position, giving you another turn of shooting it before it gets to your line and also forces him to dedicate a fair portion of his shooting into eliminating empty Raiders. In conclusion using raiders to block your opponents movement can give you more space on a finite board giving your forces more time to deal with the threat. It can also be used to reduce the effectiveness of blocked units by denying them a turn of effective action, leveraging the fact that the game is played over a finite number of turns. Hope you enjoyed this guide! Have fun blocking! How does one procure some empty raiders on the field? Also in a pinch, once the enemy tanks and other such things have been taken out by Ravagers, they can also be used in a similar manner, if need be. Maybe I'm a compulsive disembarked, but I never tend to be in short supply. If you really need one you can always disembark the passengers of a full raider into cover, turning it into an empty raider and then use it to block (a transport can move as normal after their passengers disembark as long it did not move before the passengers disembarked). Realistically though, I at most do 1-2 Raider block manoeuvres per game. Yeah, Ravagers and Venoms can be used. Ravagers are not as expendable though, but it's hard to put a price on blocking one of your opponents key units, so as you said in a pinch they work just fine. Venoms are a bit trickier due to their small size, but can work too. 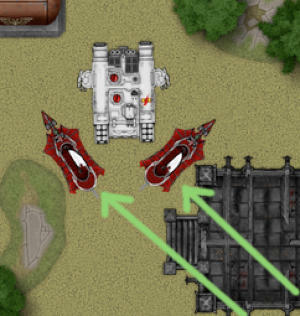 The contents of the Land Raider will not be able to perform a normal disembark as all the hatches are blocked; if they perform an emergency disembarkation they will forgo the rest of their turn (emergency disembarking units can't perform any voluntary actions during the rest of their turn). This is not completely valid, as the Landraider has exit doors in each side as well as the front. It does work with 3 blocking vehicles though, or if the landraider parked next to something impassable. Good catch. I missed that one! My original Tau version had three vehicles. I'll amend that part of the guide. You read my mind! My next guide is on blocking with reavers!!!! How did you know? you have to be careful when puting a raider in front a land raider they can ram your raiders both of them and a hit str 8 isnt good for a raider and if they blow up he will move normaly to the next unit. 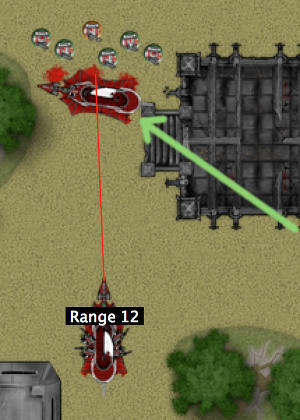 As mentioned in the guide as long as the raiders are not perfectly aligned, the raider will only hit one at a time. A ramming unit stops as soon as it comes into contact with another vehicle and only keeps moving if that vehicle explodes. The hit is S8 but AP- so there is only a 1/9 chance of the ram attack penetrating the raider and making it explode. The chance of the ram attack making both raiders explode is 1/81. Not likely. Furthermore ramming prevents units from disembarking, and forces all the land raiders shooting to be snap shots. So the end goal is achieved, the land raider doesn't move, doesn't shoot effectively and the unit it's carrying doesn't disembark. I would also note that the viability of this tactic hardly requires the Raider (or blocking Venom) to be empty - it simply requires it to be a more acceptable loss than whatever your end goal is. I block with loaded vehicles all the time. A good point, you are the most ruthless of archons. I don't go MSU to pretend that I care about the lives of my men. I had been missing the wise counsel of Mushkilla, as you were my primary source of tactics once I had my DE list honed down. These two articles have been excellent, if you could just fire off another fifty or so before my next game (Jan 3rd), that would be very helpful. PLEASE tell me someone Moddy is going to sticky these, or whatever the term is! I could see adding them to the tactics list sticky. I would oppose stickying all of them. if you could just fire off another fifty or so before my next game (Jan 3rd), that would be very helpful. Maybe not 50, but you should be getting at least two more, before the 3rd. We should really sit down and tidy up the tactics list sticky (in the new year). I'm hoping with a combination of your upcoming guide and these mini guides we will be able to build a decent repository of up to date DE knowledge. Oh gawds, double post, you have brought shame to the forum! I'm going to make 'shame to the forum' my hashtag of choice. This might be the most useful article I've ever read in regard to DE tactics. Thank you. Thanks, that's very kind of you! There will be a lot more articles to come over the next few months. I forgot to mention: let us know if you managed to pull off any of the tactics discussed in thes guides in your game and whether they proved effective or not. Thanks @Mushkilla, very good thoughts. On a related tangent, I have been considering moving a Raider in front of an enemy quad gun (or other Inteceptor) to block line if sight to an incoming Razorwing, preventing it from being shot down before at least delivering some of it's payload. It would be slightly trickier, as the movement has to be in the movement phase, meaning you need to be within 12" of your end location at the start of the turn, but has the advantage of being able to boost after blocking the shot. Unfortunately my regular opponents don't tend to use them so I haven't had the chance to try it out. @Creeping Darkness it does seem like a lot of effort when we have poison. Also blocking sight to a flyer with a raider seems like a challeng our transports have so many holes that line of sight can be drawn through compared to say a serpent or rhino. But if needs must and you can pull it off then go for it. That's the point of these guides, you won't use all the tricks all the time, some are niche, but they can win you a game in a pinch so knowing them can make all the difference. On the holey nature of Raiders, I suppose the difficulty of blocking line of sight can be both a curse and occasionally a blessing. As outlined in many posts above, the upside is being able to shoot through (or under) them while they are move blocking. It's unfortunate that the flying bases are generally too high to provide cover for disembarked troops though - providing cover to mitigate overwatch would be a handy secondary use. Oh well. I do wonder whether shooting under a raider counts as shooting through a unit.